The days get longer and warmer up here at the ranch and it's time to get outside into nature. As the spring arrives so early this year it's also time for the Bears to come slowly out of there dens and the possibility to spot one grows every day. If you want a chance to see one, go on our wildlife tours and hike or a walk into the mountains and you might be lucky to see one of these massive and impressive animals. 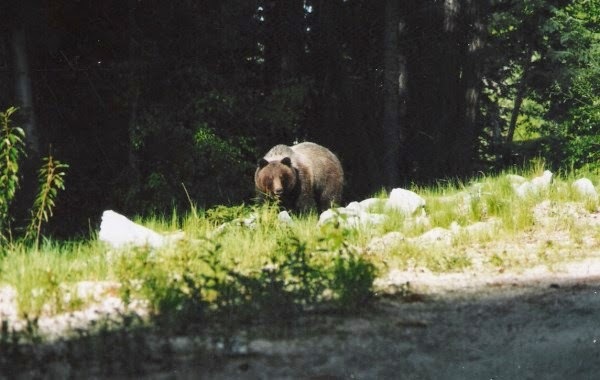 But also be aware that bears are wild animals, so make sure you have a bear spray and bear bangers with you. If you read the story below you might get a feeling of, how it is to watch a real bear in real nature. Summer is almost here. As I look out across the Ranch, I notice the snow slowly receding up the mountains a little more each day. There is a gentle humming of activity all around as we start to get ready for the summer months ahead. As I type, I hear distant and rapid footsteps. They grow louder and I sense the urgency. We jump up and race out, collecting everyone we find along the way, including the binoculars and head out to the front pasture. 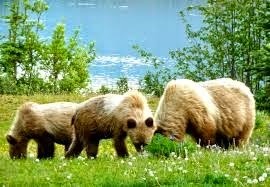 We are just in time to catch a beautiful big Grizzly with white tipped fur, loping down the road in front of the Ranch. He takes his time; Looking around, sniffing a little and checking out the place. Then, he casually jumps the Gymkhana Fence. After a moment he is gone again. Everyone’s adrenaline is pumping, and for most of us it was our first sighting. My heart was pounding and couldn’t quite believe what we had seen. By May we knew that they would start to appear but had no idea we would see one so close! And so early! Our upcoming Grizzly Wildlife Tours guests are going to be so excited! After much exhilarated talk and comparing notes on how much of it we saw, we all turn around and head back to work. “Just another day on the Ranch”, I hear someone say.